The World tarot card represents fulfillment, the culmination of our hopes and dreams and the beginning of us living those dreams. We have found ourselves in a position of being in a well-balanced relationship that fulfills the needs and wholeness of both involved. This is when you have successfully taken control of life and are living whole and complete. 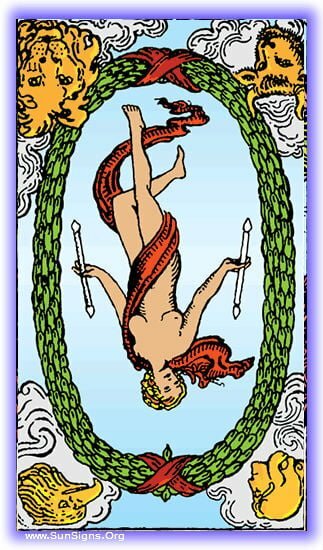 Read on to know more about the upright and inverted meanings of this Rider Waite tarot card. 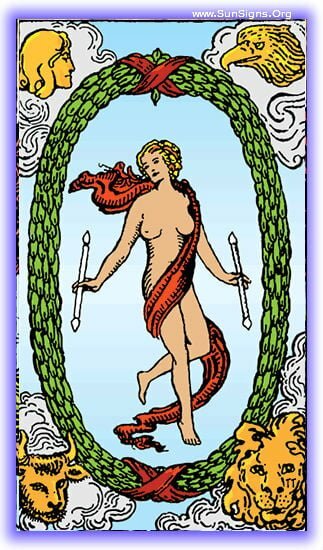 All journeys have a destination, and this Major Arcana tarot card represents that you have reached yours successfully. While each destination serves as the launching point of another journey, this is a seminal point in your journey, you have reached the culmination of all you’ve worked for at this time, and are content. You’ve been living in the glory of having seen all your goals realized, and your inner self being complete. It’s been a time of absolute contentment and fulfillment. Congratulations! That time is not past, but it’s time to begin a new path, as so long as you live, your journey will in fact continue. Finally your struggle is over, your climb and all your work have finally culminated in a point of your life where you are in fact completely content. Life is always full of minor challenges, but you know how to deal with those, and you can do so from that position of security in your current content state. You’re almost there! You have found your inner contentment, and completed your journey, now it’s just a matter of getting all your ducks in a row so that the benefits of your destination can be enjoyed. You will be spiritually and emotionally complete, and everything else will follow. You are seeking your completion, but your path is flawed. Sometimes we try to quick step things that simply must take time, spiritual development cannot be rushed. You may be trying to avoid the challenges on the road there, and thereby missing the important development that takes place as part of that. You’ve been working towards your goal, but only where you find the path easy. If you’ve been frustrated on your path, not quite making it, you’re avoiding these final challenges. You’ve come this far, it’s time to face these final challenges to reach your goal. What is the challenge you are avoiding? What are you afraid of? The final steps are right there in front of you if you’re willing to take them. You know the challenge of which we speak, its right in front of you, climb that last hill. Your path to your goal is only blocked by your own choices. There is a challenge ahead that stands in your way, and you will try to avoid it. Prepare instead to take that challenge and climb that mountain. If it is not evident now, this challenge will make itself evident soon. Next What Is The Throat Chakra?